Put on your red shoes and dance. When Dance Central was announced at E3 last year, the Kinect game received a lot of attention and glowing praise from the gaming press. However, something was missing: the ability to play with a friend. Showing off your awesome moves is great, and single-player dancing is fine when you're on your own, but with Dance Central 2, developer Harmonix is adding the ability to dance off against another player. This seemingly obvious move could be exactly what the series needs to distance itself from the rest of the Kinect offerings and become the ultimate party game. To be honest, I'm not much of a dancer. When it came to Harmonix's other series, Rock Band, I never had a problem getting on stage and jamming on the guitar, drums, or keyboard. When I stepped onstage today to try out Dance Central 2, though, I felt a little out of my element. Like Rock Band, Dance Central lets you pick your difficulty and move at your own pace, and when two dancers are playing, they can each choose a different level. This worked out well when I played with a more coordinated gamer who immediately bumped up the difficulty on his side of the screen. 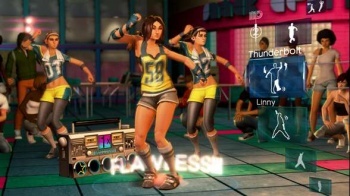 The game breaks down the dance moves individually, showing you how to move your arms and legs to get into the groove, which is pretty much the same core concept as the first game. While I didn't feel like I was ready to go on tour as a back-up dancer after one song, I must admit that I enjoyed myself even when my dance moves felt a little awkward. In the middle of the song, the instructed moves went away and Freestyle mode was triggered, which let us do whatever we wanted and then played back a video of our freestyle jam. I was told that this mode could be turned on and off, and I think it goes hand-and-hand with two-player dancing-great for a party, not necessarily something you need when you're just playing solo. The game will also have a new campaign mode and voice commands, but I didn't get to try out either of those features on the show floor. Dance Central 2 may not be enough to convince you to buy a Kinect and rearrange your living room. If you already have one, however, this just might be the Kinect title to get this fall. Sometimes you'll feel silly, and learning all of the dance moves will take a little practice, but it has the makings of a surefire party hit. I'm curious about how well the voice commands will work, and just what the campaign will entail, but the biggest new feature, two-player dancing, is definitely a huge draw and a great move forward for this series.